* Prom is on Saturday evening, May 11! * Tickets are on sale NOW! * Tickets can be purchased daily during A and C lunch or in room 206 during Futures – through to April 26. * Tickets price is now $75. * Couples tickets receive an additional $5 discount. * The senior trip to Six Flags has, unfortunately, been cancelled. * Please see Mrs. Lucier for scholarship information. And, remember – the deadlines MATTER! * Graduation is now 100% firm. Thursday evening, June 6, at 6:00 pm at the Whittemore Center at UNH. * Don't forget to order your yearbook before the final price increase. Barnes & Noble Event to Benefit the Somersworth Music Dept. * A book Fair will be held Saturday, April 20 from 11am to 4pm at the Barnes & Noble in Newington. * The middle school select choir and jazz ensemble will perform, and the high school select choir, jazz combos, and jazz ensemble will perform as well! * See Mr. LaGarde with questions. Looking for Some Good SAT Prep? 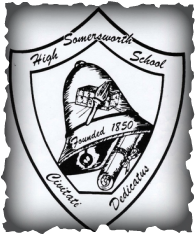 The Somersworth High School community will foster intellectual curiosity, critical thinking, and literacy in students while developing respectful, responsible, and articulate global citizens. HOMEWORK LAB AND LATE BUS!!! The late bus leaves at 3:35 pm from the high school and will drop any current Somersworth/Rollinsford bus rider to their house. Somersworth High School Career and Technical Center will be offering an after school Homework Lab this year. The Homework Lab will provide students access to academic resources and adult support. Support will be provided by content area teachers, paraprofessionals and peer volunteers. The Homework Lab will be located in the high school library, allowing access to library materials and the computer lab. Students will be expected to identify school work goals and adhere to our school wide behavior expectations. Our hope is to see students increase their ability to be successful in all of their classes! We hope you encourage your student to utilize this amazing resource!! a. Did your student AF a course, apply for an appeal and was granted it? If so, please make sure their AF grade has been updated on their transcript. You can contact guidance for information. b. Did your student qualify for Credit Recovery or Competency Recovery? Please make sure your student discusses what needs to happen with their classroom teacher. There are deadlines that need to be met and summer work may be required. If they have successfully completed the needed work, please make sure their grade has been updated to the appropriate letter/numerical grade. You can contact guidance for information.